Homo Ludens, the title of this exhibition, is the species of people who inhabited New Babylon, a future utopian city envisaged by Dutch artist Constant between 1956 and 1974. The term Homo Ludens was originally coined by Dutch cultural historian J. Huizinga in 1938, meaning a species of people whose fundamental activity is considered ‘play’. In New Babylon, Homo Ludens were free to lead creative and imaginative lives, released from labour by the development of automated systems. Here, the inhabitants were in control of their environment, able to change it to suit their needs, moods, and behaviour through the use of “moveable architectural components such as walls, floors, staircases… [and] colour, light [and] texture..”. 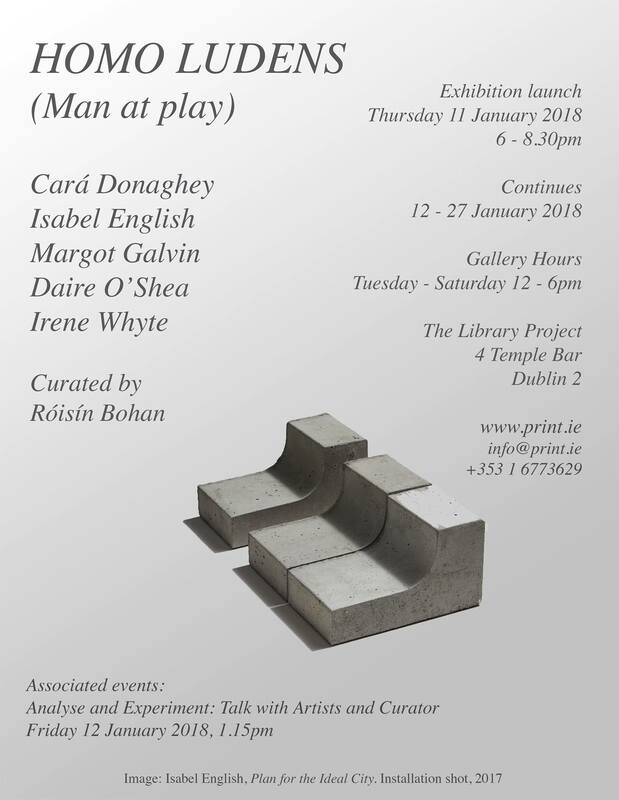 Curated by Roisin Bohan, Winner of the Black Church Print Studio ‘Recent Curator Graduate Award’, 2017.